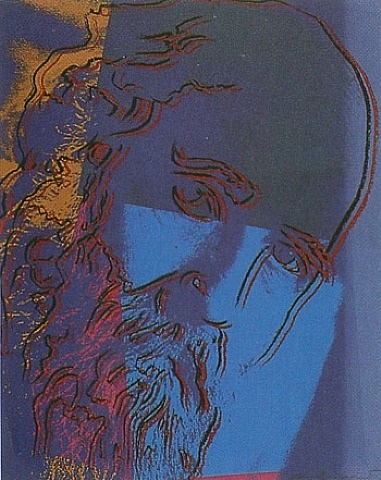 In 1980 Warhol created a series of 10 screenprints as part of his series Warhol Ten Portraits of Jews of the Twentieth Century. At the time, Warhol was increasingly criticized as a mere “business artist” and suffered a decline in his public reputation. The series received negative feedback given that Warhol was Catholic and that he himself did not invest any interest in the subjects. In fact, the idea for the series actually came from Ronald Feldman, Warhol’s dealer. Together, Feldman and Susan Morgenstein, the art gallery director of the Jewish Community Center of Greater Washington, decided on the list of names for this series. Warhol’s investment in the series may have seemed quite shallow for he merely stated he liked their faces and was interested in their celebrity status. The ten screen prints feature a collection of writers, actresses and scientists who are incredibly recognizable around the world. More than mere celebrities, these were people of great accomplishment. Martin Buber was a Jewish philosopher best known for the philosophy of dialogue, a new form of existentialism. His range of work deals with consciousness, religion, modernity and ethics. Albert Einstein was a theoretical physicist who developed the general theory of relativity, one of the two foundations of modern physics. In 1921, he was awarded the Nobel Prize for physics. In 1933, Einstein moved to the United States and spearheaded the creation of nuclear weapons in the United States. Louis Brandeis the first Jewish Supreme Court Justice who held office from 1916 to 1939. He was born to immigrant parents from the Czech Republic and attended Harvard Law School, graduating with the highest grade average in the law school’s history. George Gershwin was a composer and pianist. His compositions have been adapted to film and television. His best known works are the compositions Rhapsody in Blue and An American in Paris. The Marx Brothers were vaudeville, stage and film comedians who went by the stage names Chico, Groucho and Harpo. They are best known for the following films: Duck Soup, Animal Crackers and Monkey Business. Golda Meir was a politician and the fourth Prime Minister of Irsael. She is the first and only woman in Israel to hold such a title. She has been compared to Britain’s Margaret Thatcher and is one of the founders of the State of Israel. Sarah Bernhardt was a French actress who is regarded as one of the best actresses of all time. She began her career during the Belle Epoque period and appeared in several of the earliest films ever made. She was friends with many notable artists and writers of the time, including Victor Hugo and Gustave Doré. Sigmund Freud was an Austrian neurologist best known for developing psychoanalysis. He contributed several theories to the field of psychology, including the Oedipus complex and the importance of the subconscious. When the series was first exhibited in 1980 at the Jewish Museum in New York, it was met with much negative response. Many critics felt Warhol was exploiting his Jewish subjects without truly understanding their significance. Yet, this was Warhol’s intent, to make a series which mirrors the surface level glamour which accompanies any celebrity.